The presence of calcium (Ca) and/or magnesium (Mg) in water results in water being considered “hard.” Calcium and magnesium ions in water react with heat, metallic plumbing, and chemical agents such as detergents to decrease the effectiveness of nearly any cleaning task. Hard water can be softened using an ion exchange softening process. This guide discusses the ion exchange water softening process and related equipment used for household water treatment. An ion is an atom or molecule that has a positive or negative electrical charge. Calcium and magnesium ions are released into water as it dissolves rocks and minerals. These mineral ions in the water can cause scale buildup in plumbing, fixtures and appliances and affect their performance. In the hot water heater, heat removes some calcium carbonate and magnesium carbonate from the water, resulting in scale buildup, which can then slow the heating process and increase energy usage. Cleaning agents used with hard water are not able to completely remove dirt and grime. Clothes may become dingy and gray with time and feel harsh or scratchy. Glassware may become spotted as it dries. Films may be left on shower doors or curtains, walls, and tubs, and hair washed in hard water may look dull and not feel clean. Hard water is considered a nuisance problem, but removing hardness ions isn’t necessary for health reasons. A variety of techniques are marketed to manage hardness minerals. This NebGuide focuses on the ion exchange softening process which remains the most commonly used technique for managing hard water in residential settings. 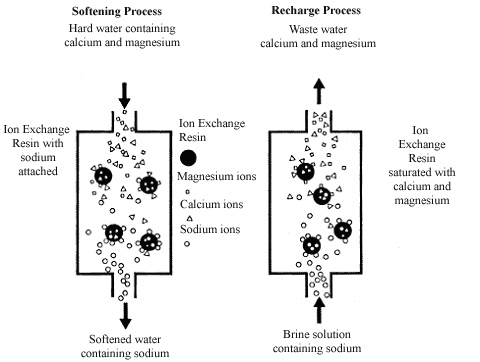 The ion exchange water softening process can remove nearly all calcium and magnesium from source water. Softeners may also remove as much as 5-10 ppm (parts per million; ppm is equal to milligrams per liter, or mg/L) of iron and manganese. Consumers can check the water softener’s manufacturer’s rating for removal of these contaminants. Concentrations of iron and manganese greater than the softener’s removal rating may require pretreatment such as greensand filters (see NebGuide G1280 Drinking Water: Iron and Manganese) to increase the lifespan of the softener. No one piece of treatment equipment manages all contaminants. All treatment methods have limitations and often water quality situations require a combination of treatment processes. Water softening does not remove bacteria, hydrogen sulfide, silt or sand, lead, nitrate, pesticides, and many other organic and inorganic compounds. Refer to Extension Circular EC703, Drinking Water Treatment: An Overview for a discussion of possible water quality problems and appropriate treatments for these contaminants. Further information can be obtained from the appropriate treatment guide in the Drinking Water Treatment series. Regardless of which water treatment system is considered, the water first should be tested to determine which contaminants are present. Public water systems routinely are tested for contaminants. Water utilities are required to publish Consumer Confidence Reports (CCRs), which inform consumers on the source of the water, concentration of contaminants present, potential health effects of those contaminants, and methods of treatment used by the utility. Depending on the population served by the water utility, CCRs may be mailed, published in newspapers, or posted on the Internet, but a copy of it can be obtained by contacting the local water utility. Public supplies must conform to federal standards established by the Safe Drinking Water Act. If contaminants exceed the Maximum Contaminant Level (MCL), the water must be treated by the water supplier to correct the problem and/or another source of potable water must be provided. In contrast, monitoring private water systems is the consumer’s responsibility. Therefore, contamination is more likely to go undetected in a private water supply. Knowing which contaminants may be present should guide the testing, since it’s not economically feasible to test for all possible contaminants. Know which contaminants are present, their concentrations, and reasons for removal (i.e., health risks, tastes or odors, etc.) prior to selecting treatment methods or equipment. Refer to NebGuide G907 Drinking Water: Testing for Quality for testing information. Testing laboratories, some city-county health departments, and some water treatment equipment dealers can test water for hardness. In addition, a variety of test kits and dip strips are available for hardness testing outside of a laboratory environment. When using these tests, users should understand the nature of the test and the accuracy of the test results. While some may provide accurate and reliable measurements from which decisions can be made, others may not. Greater reliability and accuracy can be expected with laboratory testing. In situations where considerable investment is necessary to correct a problem, verification of the severity of the problem by an approved laboratory is advisable. It is also important to periodically re-test after installation of treatment devices to evaluate the effectiveness of the treatment equipment. Water hardness is often expressed as grains of hardness per gallon of water (gpg) or milligrams of hardness per liter of water (mg/L). Table I, adapted from the Water Quality Association (WQA), shows hardness classifications. Hardness ions are typically combined with sulfate, chloride, carbonate, or bicarbonate ions. For consistency, concentrations are generally converted to the equivalent concentration as calcium carbonate (CaCO3) and expressed in terms of hardness as calcium carbonate. Table I. Classification of water hardness (hardness as calcium carbonate). Household water softeners are ion exchange devices. Ion exchange involves removing the hardness ions calcium and magnesium and replacing them with non-hardness ions, typically sodium supplied by dissolved sodium chloride salt, or brine. The softener contains a microporous exchange resin, usually sulfonated polystyrene beads that are supersaturated with sodium to cover the bead surfaces. As water passes through this resin bed, calcium and magnesium ions attach to the resin beads and the loosely held sodium is released from the resin into the water. The softening process is illustrated in Figure 1. After softening a large quantity of hard water the beads become saturated with calcium and magnesium ions. When this occurs, the exchange resin must be regenerated, or recharged. To regenerate, the ion exchange resin is flushed with a salt brine solution (Figure 1). The sodium ions in the salt brine solution are exchanged with the calcium and magnesium ions on the resin and excess calcium and magnesium is flushed out with wastewater. Figure 1. The water softening and recharge process. Frequency of the regeneration or recharge cycle depends on the hardness of the water, the amount of water used, size of the softener, and capacity of the resins. Sixty to 120 minutes generally are required for the brine to pass through the unit and flush the tank before soft water is available again. Through the softening process, sodium is added to water at a rate of about 8 mg/L for each grain per gallon (gpg) of hardness. After treatment, water that was 10 gpg of hardness will have about 80 mg/L of sodium. This means that for every liter (0.26 gallon) of water intake, there would be 80 mg of sodium intake. People on restricted sodium diets due to health reasons should account for increased intake through softened water and consult their physician. Drinking and cooking with softened water is often avoided by having a cold water line to the kitchen tap that bypasses the water softener. This provides hard water for drinking, cooking and other uses. It is not recommended to repeatedly use softened water for plants, lawns or gardens due to the sodium content. Semi-automatic: These require the operator to initiate the regeneration cycle. The necessary steps to complete regeneration and return to service are done automatically by the softener controls. Automatic: Fully automatic softeners are typically equipped with a timer that automatically initiates the regeneration cycle and the required steps in that process. The operator only sets the timer and adds salt as needed. Regeneration is generally done during periods of low water usage, such as between midnight and 4 a.m.
Demand-initiated regeneration (DIR): Demand-initiated regeneration units initiate and handle regeneration operations automatically in response to the demand for treated water. Need for regeneration is determined by measuring gallons of water used or the change in electrical conductivity of the resin bed, or by sensing a change in water hardness. DIR units may have two softening tanks and a brine tank so that one tank can be softening while the other is recharging. DIR units may lead to less overall usage of salt and water since regeneration is only done when necessary. Off-site regeneration: Rental units are available in which the resin tank is exchanged in the home and then recharged at a central location. All types of softeners must be correctly installed and monitored for proper operation. If an automatic or DIR unit appears to use more salt than expected or water is not softened, have a service provider check the unit settings. The amount of salt used for softening depends on the number of people in the household, daily water usage, softener capacity, and water hardness. The appropriate size of water softener depends on several factors including the water hardness level, daily water use and water flow rate. There are different types of salt available for water softeners. The choice depends upon the type of water softener and manufacturer design. Softeners are designed to use specific types of salt so it is important to follow manufacturer’s recommendations regarding the salt type. Compressed salt has undergone an evaporation and compression process that yields small particles referred to as pellets, nuggets, or beads. A variety of grades and formulations are available on the market. Products designed to manage iron (rust) may contain food-grade additives, such as citric acid. Compressed salt is sized according to manufacturer’s specifications. The majority of softeners are designed for this type of salt. Salt blocks for use in some softener brine tanks look similar to those used for livestock feeding. Blocks for livestock feeding, however, may contain additives incompatible with water softener units. Block salt should be used only in those units specifically designed for this form of salt. It should be high-grade evaporated salt without additives. Rock salt may have high levels of soluble or insoluble impurities. If the impurities are calcium or magnesium salts, they may significantly reduce the effectiveness of the regeneration process and plug valves. Rock salt is only an option if suggested by the manufacturer and only those averaging less than 1 percent impurities should be used. In certain situations, potassium chloride may be used for softener regeneration instead of sodium chloride. Potassium chloride can be more costly and more difficult to obtain than sodium chloride, however. Potassium chloride also adheres more strongly to the resin. This can reduce the exchange efficiency compared to sodium chloride and require more potassium chloride. Substituting potassium chloride for sodium chloride may be appropriate if health or environmental reasons necessitate restricting sodium; a water treatment professional should be consulted regarding this option. Maintenance of water softening equipment is somewhat dependent on the type of softener. Some degree of monitoring or managing the regeneration process is generally required. The softener must be kept regenerated to avoid hard water flowing into pipes and appliances. Regeneration does place additional load on a septic system. Approximately 50 gallons of water (roughly equal to that required for a load of laundry using an older washing machine, or two loads using a newer high-efficiency washing machine) is used to regenerate a water softener. Also, certain situations such as high concentrations of iron or manganese in the water can affect the exchange capacity of the resin. In this case the resin may eventually need to be cleaned or replaced. A water treatment professional should be consulted for guidance on cleaning or replacing the resin. The brine tank requires periodic checking and cleaning. How frequently you clean it depends on the type and amount of salt and characteristics of the water being treated. Inspect the tank for scale build-up. The brine valve and float assembly, if used, should also be cleaned and inspected at least once a year. Adequate backwashing of the resin bed is important to ensure efficient regeneration of the unit. If backwashing is to be done manually or is semiautomatic, the backwash should be continued until the water runs clear. If the unit is fully automatic and backwash time is adjustable, adjust the time so the backwash is long enough to produce clear water in the drain. Excess iron (above 5 ppm) or hydrogen sulfide in the water can reduce the effectiveness of the water softener. The water should be tested for these contaminants and proper pre-softening equipment installed if required. NebGuides G1280 Drinking Water: Iron and Manganese and G1275 Drinking Water: Sulfur (Sulfate and Hydrogen Sulfide) discuss these contaminants. Sediment in the water can also reduce the effectiveness of the softener. The NebGuide G1492 Drinking Water Treatment: Sediment Filtration discusses options for sediment removal. Federal, state, or local laws do not regulate water softening home systems. The industry is self-regulated. The NSF (formerly the National Sanitation Foundation) and the Water Quality Association (WQA) evaluate performance, construction, advertising, and operation manual information. The NSF program establishes performance standards that must be met for endorsement and certification. The WQA program uses the same NSF standards and provides equivalent American National Standards Institute (ANSI) accredited product certifications. WQA certified products carry the Water Quality Association Gold Seal. Though these certifications and validations should not be the only criteria for choosing a water softening system, they are helpful to ensure effectiveness of the system. Other important guidelines are discussed in NebGuide G1488 Drinking Water Treatment: What You Need to Know When Selecting Water Treatment Equipment. The NebGuide series on drinking water treatment focuses on contaminants most likely to be encountered in Nebraska drinking water supplies. Some water supplies may contain contaminants not addressed in this series, such as cryptosporidium, giardia, hexavalent chromium and others. Drinking water treatment by water softening (ion exchange) is one option for the homeowner in treating water problems. Calcium and magnesium ions in water decrease the effectiveness of most cleaning tasks and can cause film and scale buildup in and on plumbing and fixtures. Water softening is an effective method for reducing the calcium and magnesium mineral ions from the water. It can also reduce iron and manganese concentrations. Selection of an ion exchange water softening unit should be based on water analysis and assessment of the individual homeowner’s needs and situation. Regular maintenance of the unit is a critical factor in maintaining effectiveness of the unit. NSF and the WQA test and certify products and this certification can help guide selection. The authors wish to acknowledge the contribution of former UNL Extension Engineers Jodi Kocher and DeLynn Hay, and former UNL Extension Specialist Shirley Niemeyer who collaborated with them in previous versions of this NebGuide.